Join our LIVE Webinar, powered by Abacus in collaboration with SAP. Gain a deeper understanding of how you can transform your business with a single cloud-based ERP solution. Cover a range of business and technical topics aimed at providing you with up to date information on SAP Business ByDesign. Ask anything from our subject matter experts! In a nutshell, this webinar will help you to get a better sense of what ERP actually is and how it works. Register Now for a free virtual event to get first-hand expertise and knowledge from SAP solution experts & Abacus executives. 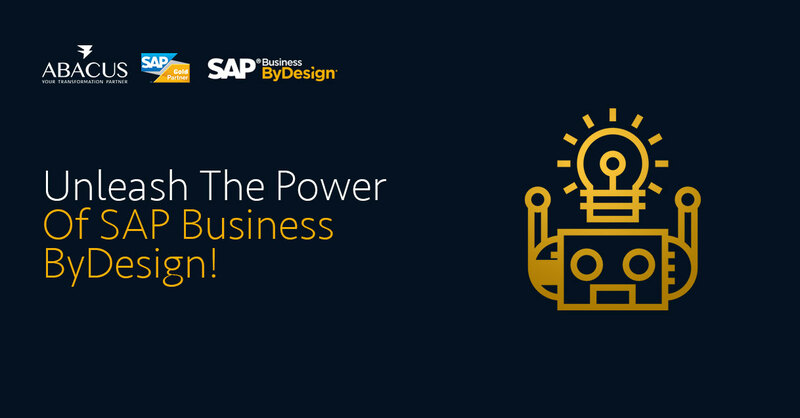 SAP Business ByDesign is a truly holistic & on-demand business suite which integrates all core business functions across your entire company with a minimal cost of ownership. This robust cloud-based solution comes with virtually everything your business needs to operate well across all sectors. SAP Business ByDesign is multi-featured, customizable, secure & scalable. Sessions will cover an overview of SAP ERP solutions, features and benefits. (Completed) Sessions will focus on best practices, Comprehensive details of service features and demos. (Coming soon) Sessions will dive deeper into service features, lessons learned, and deployment examples. (Coming soon) Sessions will focus on more complex topics on SAP Business ByDesign in-depth understanding of service use cases and SAP platform.